10:1 This is the family tree of Noah—his relatives born after the flood, and descended from his three sons Shem, Ham, and Japheth. 10:2 Japheth’s descendants: Gomer, Magog, Madai, Javan, Tubal, Meshech, and Tiras. 10:3 Gomer’s descendants: Ashkenaz, Riphath, and Togarmah. 10:4 Javan’s descendants: Elishah, Tarshish, Kittim, and Rodanim. 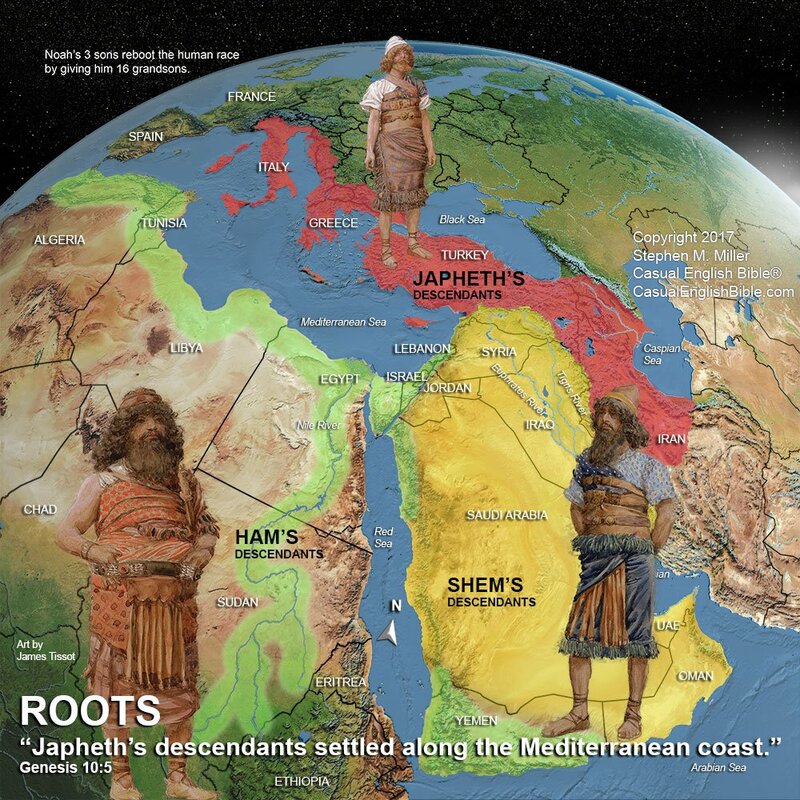 10:5 Japheth’s descendants settled along the Mediterranean coast. They had their own tribes, nations, and language. 10:6 Ham’s descendants: Cush, Mizraim, Put, and Canaan. 10:7 Cush’s descendants: Seba, Havilah, Sabtah, Raamah, and Sabteca. Raamah’s descendants: Sheba and Dedan. 10:8 Another famous descendant of Cush was the world’s first heroic warrior, Nimrod. 10:10 He built his nation in Babylonia.1 Major cities: Babylon, Erech, Akkad, and Calneh. 10:12 and the famous city of Resen, located between Nineveh and Calah. 10:14 Pathrusim, Casluhim, and Caphtorim,3 ancestor of the Philistines. 10:18 the Arvadites, the Zemarites, and the Hamathites. Canaan’s families scattered. 10:19 The Canaanite homeland stretched from Sidon in the north.4 That’s in the direction of Gerar. It extended as far south as Gaza. That’s in the general direction of Sodom, Gomorrah, Admah, Zeboiim, and Lasha. 10:20 These were the descendants of Ham. They lived as extended families in their own tribes and among their own nations. They spoke their own languages. 10:21 Shem also had many descendants. He was Noah’s oldest son, the older brother of Japheth, and the ancestor of all the descendants of Eber. 10:22 Shem’s descendants: Elam, Asshur, Arphaxad, Lud, and Aram. 10:23 Aram’s descendants: Uz, Hul, Gether, and Mash. 10:24 Arphaxad’s descendants: Shelah, who was the father of Eber. 10:25 Eber’s descendants: Peleg and Joktan. Peleg is Hebrew for “divided.” He got that name because he lived at a time when tribes were divided into different nations. 10:29 Ophir, Havilah, and Jobab. All of these people descended from Joktan. 10:31 These were the descendants of Shem. They lived as extended families in their own tribes and among their own nations. They spoke their own languages. 10:32 These are the descendants of Noah, by tribe and nation. Every nation on earth descended from them after the flood. Shinar in Hebrew. Based in what is now southern Iraq. Northern Iraq and parts of Turkey. Caphtor is a name associated with the islands of Crete and Cyprus, along with several other locations. In what is now Lebanon. Possibly part of the Arabian Peninsula. Family trees seemed more important to people in ancient times than they do today. We find them all over the Bible, reporting the first humans on record all the way up to the family tree of Jesus. Why do you think these genealogies show up so often in the Bible? The Genesis writer did not report the family tree of all the starring characters in the book. But he does tell us about the sons and grandsons of Noah—who they were and where they settled. Why do you think the writer bothered doing that? Of the many people listed in this family tree, which ones catch your eye as especially interesting or curious? LIFE APPLICATION. If you had to tell someone the names of your parents, grandparents, and great-grandparents, how far could you climb up into your family tree? And what value would there be in doing a better job of remembering our family heritage—the people and their stories? LIFE APPLICATION. Miller dedicated A Visual Walk Through Genesis to Milo Skinner and his grandfather Hal Skinner. He taped a short video about them, too: When the ones we love have died. They were the son and father of Miller’s editor, Gene Skinner. While Gene was editing this book, Milo and Hal died in the crash of a small airplane shortly after takeoff. In Miller’s dedication, he described Milo and Hal as “A young man and his grandpa who have reminded me to love the souls around me while they’re near, and then when they’re gone, to never forget their stories and the reasons why we love them still.” Can you tell us one of your favorite stories about someone you loved who has died?